Donated: a 1929 Buzzer and some classic tickets! Just want to point out something I got a while back: a 1929 Buzzer! 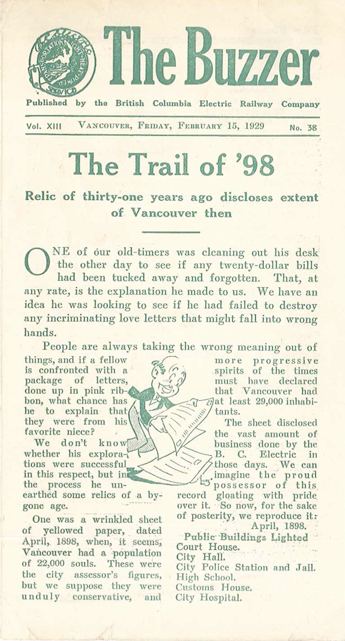 It actually describes the discovery of an old document showing the state of Vancouver in 1898, which the Buzzer considered hilarious ancient history. Download a PDF of the full Buzzer here to read all the details! For background: Bob Hassan kindly sent this Buzzer along to me—it was part of his father’s collection, which Bob received when his father passed away. I asked Bob if he could tell us a bit about his father, and Bob said that his dad was named Harold Hassan, and was born in Brandon, Manitoba in 1906. He moved to Vancouver in 1910, and spent the rest of his life here. He was interested in everything, loved to save things, and had a fantastic memory: eventually he was president of the BC Pioneers historic association. And because Harold could never drive a car because of his eyesight, that’s why he had transit items in his collection. 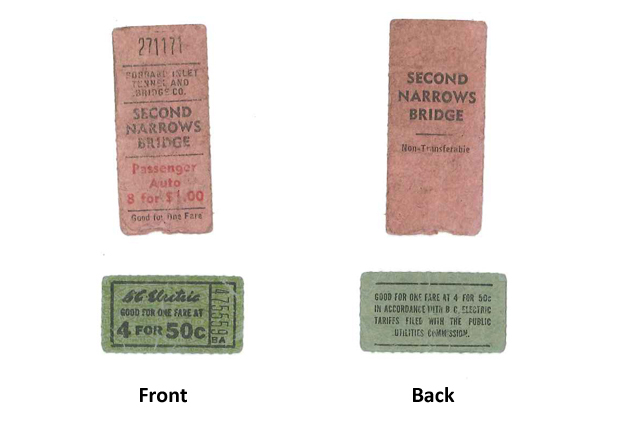 Bob also sent along a couple of transit tickets his father had saved: here they are! Thanks again to Bob for sending this along! If anyone else happens to find an old Buzzer in their holdings and you don’t know what do with it, please do send it in to TransLink: just write to the attention of the Buzzer editor, 1600 – 4720 Kingsway, Burnaby, BC V5H 4N2. We love collecting this sort of thing in our archives!